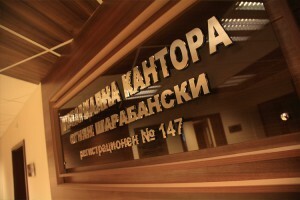 Notary Office Sharabanski is open since 09.09.1998 under the charge of Notary Ognyan Sharabanski entered in the register of the Notary Chamber with No. 147 to act in and for the area of Regional Court of Varna. 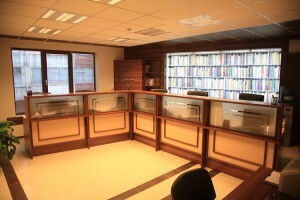 Lead by striving for protection of ownership rights, for exercising citizen’s legal rights and protecting their legal interests, the team of Notary Office Sharabanski offers responsibility, professionalism and transparency, aiming at and contributing to establishment and earning more and more public trust in the notarial activities. 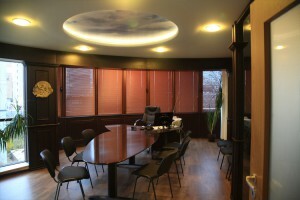 Carefully analyzing the notarial procedures and our client’s needs and in view of providing most quick and qualitative service, we, the team of Notary Office Sharabanski, attentively listen to your wishes and do our best to maintain high level of notarial services in the city of Varna. Over the years, Notary Office Sharabanski has considerably improved its service functionality and promptness, keeping and upgrading its team. I want to sign a Power of Attorney for administration and disposal of property. When a Power of Attorney for disposal of property is issued, the person’s signature and the document content must be certified and stamped with two separate stamps. The notary is obliged to require presentation of a title document for the real estate. The Power of Attorney must be certified in two identical original copies. In case of a disposal deal, two declarations pursuant to art. 264, par. 1 of the Tax and Social Security Procedure Code and one declaration pursuant to art. 25, par. 8 of the Notaries and Notarial Activities Act must be certified, having validity by the end of the respective calendar year. My child is going to travel abroad. When the person is juvenile or minor /under the age of 18/ and not accompanied by both parents at the same time, a declaration of consent is necessary to be issued by them, so that the child may cross the Bulgarian border. In case that the one of the two parents is going to accompany the child during traveling abroad, a notarized declaration issued by the other parent only is needed. The child’s Birth Certificate must be presented at the notary office for the issuance of such a declaration of consent. Which documents certify the person’s identity? These are for Bulgarian citizens: identity card, dver’s license or passport. For foreigners: national passport /identity card/, along with а card for foreigner’s long term or permanent residence in Bulgaria, if issued. The international passport is not accepted as identity certifying document. Do the Powers of Attorney have period of validity? If a period of validity is not specified in the Power of Attorney, it shall be valid for unlimited period of time and up to its cancellation by the authorizer, as long as the empowered person refuses to exercise the powers granted or until one of them (authorizer and/or empowered person) dies (or the juridical entity is terminated). Is it compulsorily, the motor vehicle tax to be paid in advance? Upon purchase / sale of a motor vehicle, the Seller must present to the Notary a certificate of paid tax, issued by Local Taxes and Fees Department. It is compulsory and without this document the Notary wouldn’t certify the signatures laid in the Purchase and Sale Contract, as the latter bears а joint and several liability for the motor vehicle tax debts. On presentation of a bank statement for a bank transfer made, the Notary is obliged to double check with the Local Taxes and Fees Department. In which cases my husband’s / wife’s presence is needed, when I am selling my property? According to the Family Code, the items acquired during marriage for value are a community property, unless another property separation regime has been agreed or they are subject to a marriage contract. Even if husband’s / wife’s name only is entered in the purchase deed, the property in question is a community property. May a General Power of Attorney be issued to me? General Powers of Attorney exist in theory, but in practice, every institution requires its name to be explicitly mentioned in the certified document, in order to accept the representative power of the empowered person. Particularly pedantic in this respect are the banks that have strong requirements regarding the content of a Power of Attorney and usually re-examine the issue by giving a phone call to the notary office. When certifying a Power of Attorney, is it necessary the empowered person to appear in front of the Notary? The authorization is an unilateral declaration of Authorizer’s will. Only the authorizer must present himself in person in front of the Notary for certification of his signature.